The Incrediball hydrangea (Hydrangea arborescens 'Abetwo' Incrediball™) is a broadleaf, deciduous flowering shrub. Like the Annabelle hydrangea, it is hardy and flowers on new wood, but Incrediball has stronger branches and bigger flower heads than the Annabelle. The cultivar name is 'Abetwo,' while "Incrediball"—notably, not "incredible"—is a trademark name. "Incrediball" was presumably chosen as the name to trumpet the impressive size of the "balls" of flowers. Incrediball hydrangea plants can be used in the landscape in a number of ways. These shrubs are attractive enough to be used singly as specimen plants. Some gardeners choose to grow them en masse along a property line to form a border, while others include them in foundation plantings. Their shade-tolerance makes them suitable for woodland gardens, although they may produce larger flower heads in full sun than in partial shade. Incrediball hydrangeas are plants that attract butterflies. They will grow in USDA plant hardiness zones 4 through 9 and are potentially hardy to zone 3 in a suitable microclimate. Space the plants 5 to 6 feet apart, center on center. As they grow, they can create gorgeous privacy hedges, though you could also grow them in very large garden planters. Incrediball hydrangea grows in full sun to partial shade, and the latter is preferable in dry climates. If you live in the south, give the plant some shade in the hot afternoon hours. In the north, full sun can be tolerated throughout the entire day. Plant the Incrediball hydrangea in rich garden soil that will keep the roots moist. Unlike some other hydrangeas, Incrediball's flower color is not affected by soil pH. While the petals of other types of hydrangeas may change colors because of pH, this is a white hydrangea plant, pure and simple. These varieties of hydrangeas are surprisingly drought-tolerant. If the plant is being grown in full sun, provide moisture to the soil constantly. Once established, the deal temperature for H. arborescens hovers around 70 degrees Fahrenheit during the day and just below 60 degrees Fahrenheit at night. However, during the bud development stage, the hydrangeas need six weeks of temperatures below 65 degrees Fahrenheit. Fertilize the hydrangea once in the spring with a 15-30-15 formula—or one that's similar—to coax out the plant's blooms. Transplant young plants when they're dormant during the early spring months. Already-established plants, particularly when they've grown larger, are difficult to move, though it's not impossible. After you transplant, prune the top growth to reduce water loss. 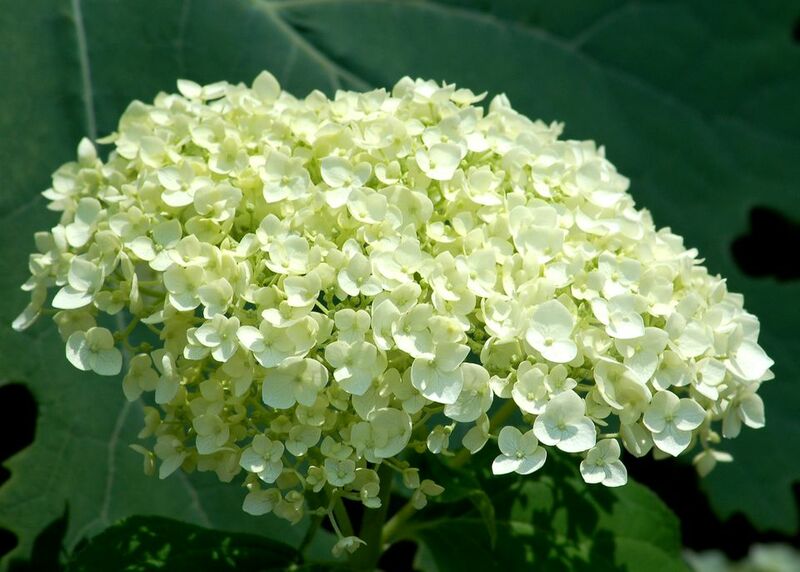 All types of Hydrangea arborscens are toxic to dogs, cats, and horses due to the cyanogenic glycoside content. Although intoxication is rare, symptoms of consumption include vomiting, depression, and diarrhea. If humans ingest H. arborscens, they might experience a mild upset stomach; it can also aggravate skin allergies. Propagate H. arborescens via cutting and rooting. First, take a 5- to 6-inch-long cutting from a hydrangea brunch, ideally from one that didn't flower that year. Next, remove the lower leaves from the two lower nodes and dip the cuttings in a rooting hormone. Place the cutting into a sterile medium, such as damp vermiculite or coarse sand, water it well, and let it drain until the soil is moist but not soggy. Cover it with plastic, but don't let the plastic touch the leaves. Place the cuttings in bright light, but not in the sun. Once the soil begins to feel a bit dry, water the soil again. The cuttings will form roots ina bout two to three weeks. Incrediball hydrangea plants and other hydrangea shrubs in the native American "smooth leaf" (arborescens) group (including Invincibelle Spirit, another variety inspired by Annabelle) bloom on new wood. Consequently, the question of when to prune is greatly simplified because there is no issue of losing flower buds that formed on old wood, or the prior year's growth. For the same reason, flower buds won't be killed during a cold winter. Prune Incrediball hydrangea plants anytime between the first hard frost of fall and early spring. Depending on your preference, you can make pruning cuts right down to the ground, as new shoots will be generated. Most gardeners opt for an early-spring pruning, taking advantage of the visual interest the dried flower heads add to the fall yard. Because the flower heads consist mainly of tough sepals, they persist right through autumn, although the color does fade to a tan. People often cut some of the flower heads for use in dried arrangements. Hydrangeas aren't susceptible to serious pests or diseases, but they can fall prey to common complaints such as the occasional powdery mildew. If it crops up and the problem is serious, treat the plant with a fungicide and destroy all the fallen foliage during the autumn months.